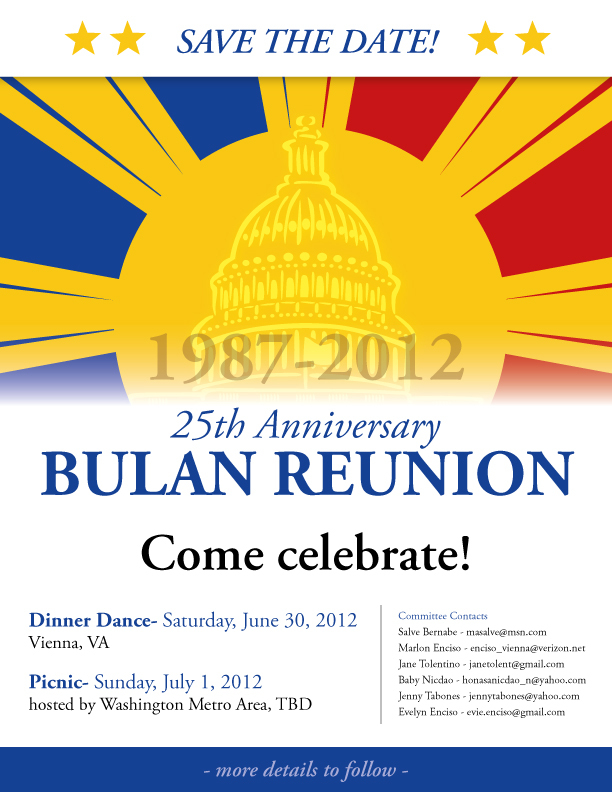 Category Archives: Bulenõs in U.S.
As you all know, Year 2012 is the Bulan Reunion’s Silver Anniversary…..a very important milestone in our group’s history! A “SAVE THE DATE” flyer was sent to you previously with information on the celebration planned in the Washington D.C. Metro area. It’s now only 68 Days and counting until the big event……….! Woohoo!!! Attached is your Invitation, along with attachments (listed below)! We hope most of you, if not all, can come and be a witness to this historic event. Please forward this Invitation and all attachments to others who may be interested and/or are not included in the list of addressee above. 1. The deadline for receipt of paid reservations to the Dinner-Dance is Tuesday, June 14, 2012. 2. The attire for the Dinner-Dance is semi-formal. 3. There is a 5:00 P.M. mass on Saturday at Our Lady of Good Counsel Church. Some of you may choose to go Mass first and then proceed to the Dinner-Dance after. 4. Beer and wine will be provided FREE at each table. who’ll be with you as they need to be counted for seating purposes. the right to limit the number of children under 12 at the Dinner-Dance should the need arise to accommodate seating for paying guests. 6. Additional information regarding the opportunity to advertise in the Dinner-Dance Programme will follow. Please note that we have booked ten (10) discounted rooms at the Embassy Suites under the group name “Bulan Reunion”. If you’re interested in availing yourself of the discount, it is suggested that you make reservations at the earliest possible time as these rooms will be going fast. 3. Directions to Frying Pan Park, the picnic venue. PLEASE CALL ANY OF THE COMMITTEE MEMBERS IF YOU HAVE QUESTIONS (see attachment#1 for contact numbers). THANK YOU! DIOS MABALOS! SEE YOU ALL!